Provide a modern base to your favorite potted plant with the Panacea Wood Industrial Round Plant Caddy. 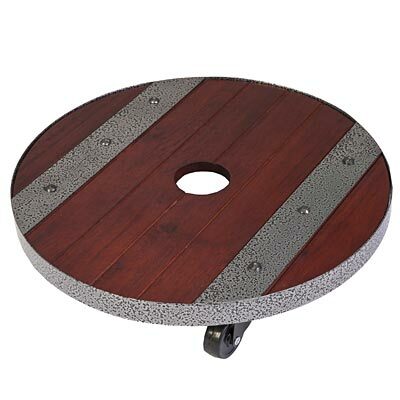 The generous size, durable materials, and sturdy wheels make this item a fantastic support for pots with a 15" diameter or smaller base. Wide, wooden slats form the round body of this piece, surrounded by a lasting metal band. Two metal slats on the body add extra strength, and perfectly hold the four metal wheel assemblies. The mottled gray finish on the metal contrasts the reddish brown hue of the wood, and two of the wheels lock into place to keep your plant at the right display spot. A 2.25" diameter opening in the center of the caddy allows water to drain from your plant, and the unit is perfect for use indoors or outside. Elevate a large potted plant easily using this Wood Industrial Round Plant Caddy. Gardman Plant Caddy, Green, 16" dia. Gardman Extra Heavy-Duty Plant Caddy, Black, 16" dia.